Cell voice use on planes? 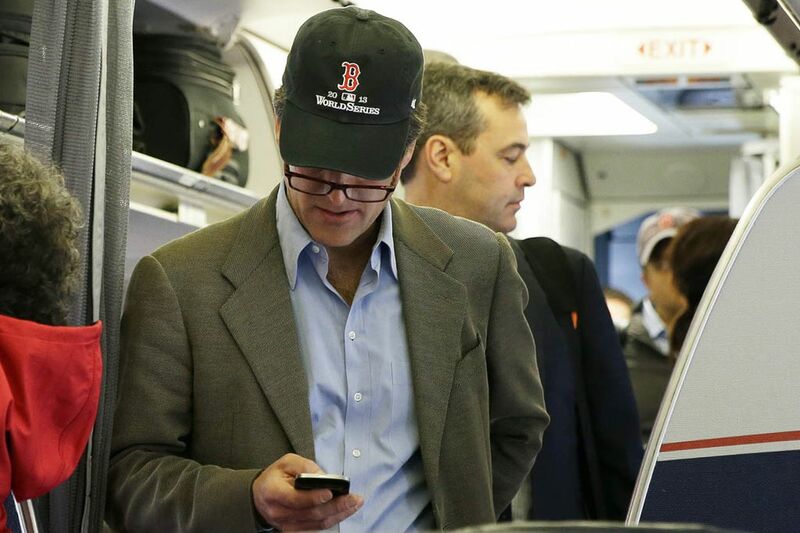 A passenger checks his cellphone while boarding a flight in Boston. FCC, ARE YOU FREAKING CRAZY? If you enjoyed your Thanksgiving holiday, I am pretty sure you didn't fly to get there and back. The weather created delays for many travelers, adding to the aggravation of getting to the airport real early to stand in real long lines and perhaps buy real overpriced food to take on airlines that have scrapped free food but added fee baggage (not you, Southwest, mwaaah!). When aboard, you should be able to fly in relative quiet and modest comfort (providing you are not too wide and not too tall). Who wants cellphone jabber in an enclosed tube from which there is no escape? Only people so "important" (or needy) they can't bear being cut from their electronic umbilical cord. Cellphone addicts don't feel any obligation to the mental well-being of those around them. It is an addiction, but, you know, if smokers can do without polluting the air for a few hours, phoneheads can do without disturbing the peace. A Huffington Post/YouGov poll showed only 31 percent of fliers favor in-air cellphone use. The more frequently you fly, the louder your NO vote. The Association of Flight Attendants released a statement saying because "passengers overwhelmingly reject cellphone use in the aircraft cabin," the AFA flatly rejects "any changes that would allow in-flight voice calls." Victoria Day, spokeswoman for Airlines for America (A4A), the airlines trade association, thinks it is "premature for a position, because carriers will be individually seeking customer feedback." I'm a customer of USAir and Southwest. USAir spokesman Todd Lehmacher says it's letting A4A take the lead (in dodging this), but Southwest spokeswoman Brandy King says because of the "disruptive nature of voice service," Southwest will prohibit it. Yesssss, Southwest! I don't want to be forced to endure the screeching of a macaw next to me during a flight. I can't escape it on elevators, but those are short trips. Listening to Edgar or Evelyn blab - usually loudly - while I am strapped in the next seat is like the rack and should qualify as torture under the Geneva Convention. The decision will be made next year, and even then, the FCC says, each airline will be its own decider. While airlines have no greater passion than my comfort (pardon the sarcasm), I don't trust them. I can imagine moneygrubbing carriers offering the pained majority an option to be away from the jabber jockeys - like Amtrak's "Quiet Cars," which started in 2000 and spread quickly because of passenger demand. I don't want to be cynical, but I'm guessing the airlines would charge extra for "Quiet Rows" (which wouldn't work) just as some now do for window seats, rewriting tickets or early boarding. Most major airlines are greed machines, pirates with jets. Addicted passengers who must reach out and touch someone can silently text, instant message or email without disturbing those around them. It's methadone for their cell addiction. The FCC's idea (proposed by new Chairman Tom Wheeler, a former telecommunications industry lobbyist, imagine that) is a cause without a constituency and a pain in the ears to the vast majority of already-plundered air passengers.